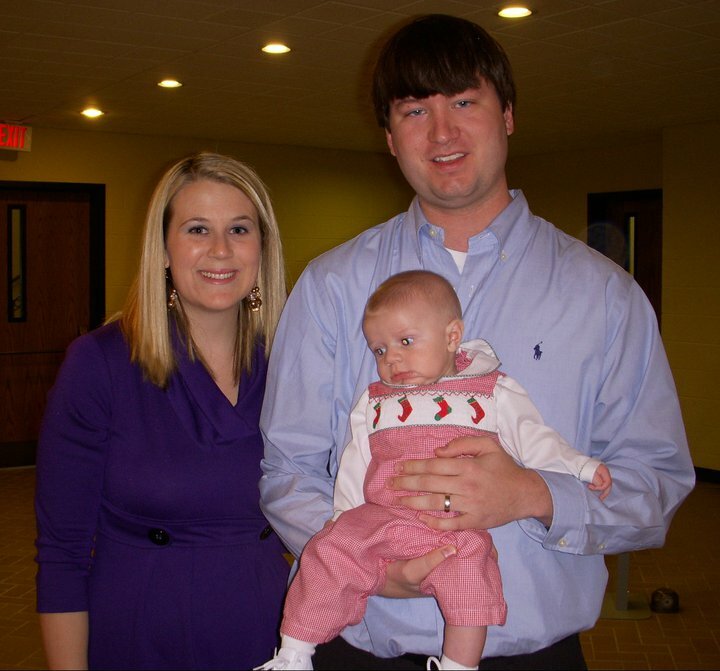 This past Sunday was our baby dedication for little Grayson. He wore his smocked little Christmas outfit AND big boy shoes! He looked so cute! The whole fam came in town to watch. It even snowed the whole day! It was FREEZING. Grayson's bff, Molly Cate, was also being dedicated. She was in her Christmas best, too. Are they not the sweetest little pair?! Caron and I with our babies. So fun! We had to get to the church 30 minutes before the service started to take family pictures. Grayson was happy and smiling...until the church doors open. Apparently, our child does not like "big" church. He SCREAMED the entire time during the dedication and would not calm down. Our pastor even commented on his "great set of lungs." Ha! Our first public meltdown. Molly Cate was very concerned and just kept staring at her friend wondering what was wrong. It was definitely a moment we won't forget! Regardless of our sweet boy's terrible church behavior (we'll work on that!) it was still a special day. I pray for this boy every night and I can't wait to see the great things he does as he gets older! A sweet lady once said to me in church, of my baby's babblings, "Oh, that's just baby music." How I appreciated her not expecting adult behavior from my little one. Little Grayson is precious!